I've been a busy girl lately... buying things for the shop like a madwoman with cash flying out of my wallet at every turn, photographing everything on my cute lady friends, making plans for upcoming photo shoots, and squeezing in a few rounds of karaoke whenever possible. I have an entire clothing rack of amazing vintage pieces to sell right now and I love just staring at all the pretty colors and fabrics side by side. Of course, my weak willpower means that I inevitably keep a few goodies for myself (like the pretty 1930's dress in these photos). But don't worry, I saved plenty for you. P.S. I've been tumbling like crazy lately, take a peek. Loving the handbag,and would love to see pix of you karaoke-ing like a crazy person...I went a karoke joint in Sydney with Misfits Vintage called the Ding Dang Dong.Made me crazy,I can tell you! keep finding the goods girl! and you look so cute in that dress. always. 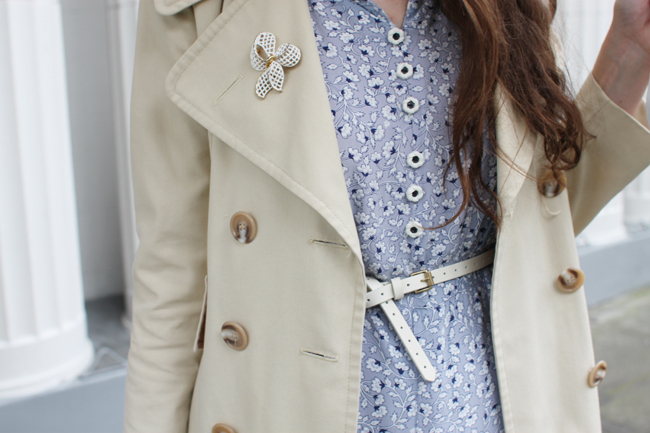 lovely dress and i LOVE that trench! 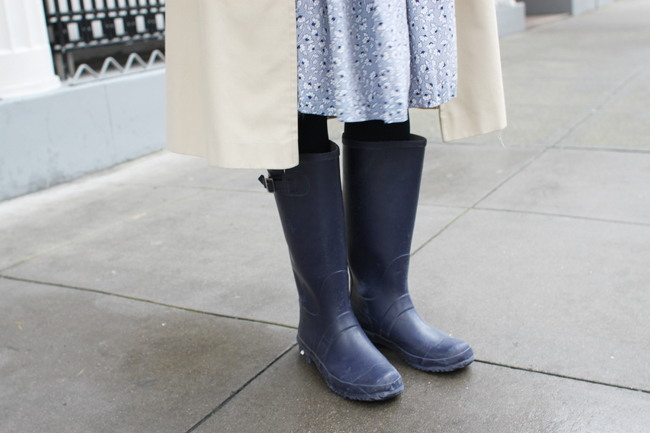 and it is too funnt how great you can pull off rubber rainboots paired with such a classy dress! Love everything about this post. The clothes are adorbs, the colors in the photography are amazing, and THAT umbrella! Beautiful! 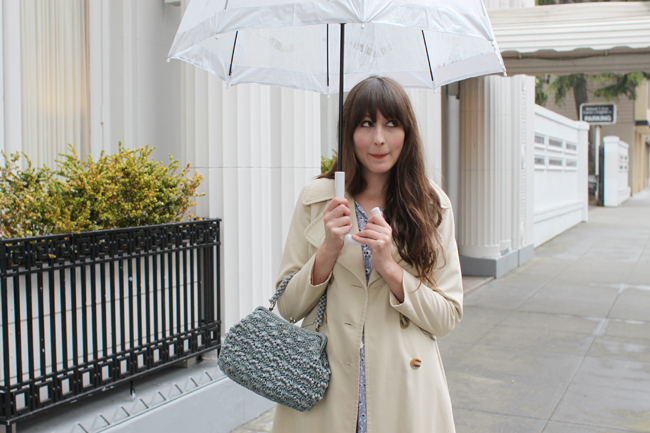 Is it weird to say that I LOVE your umbrella? adorable & functional! who could ask for more? 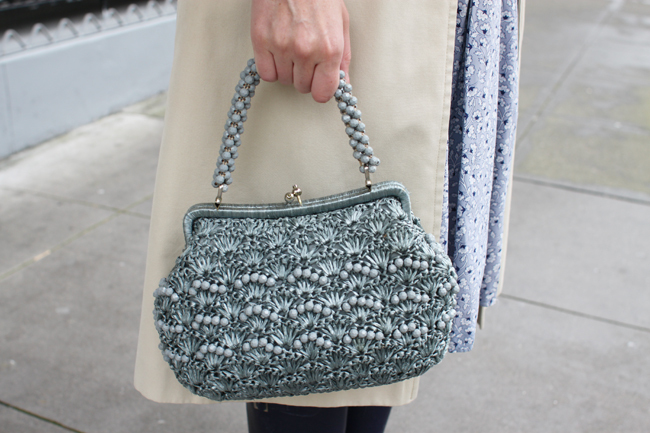 the length of the trench makes the whole thing SO elegant! love it! You look gorgeous in that dress!! 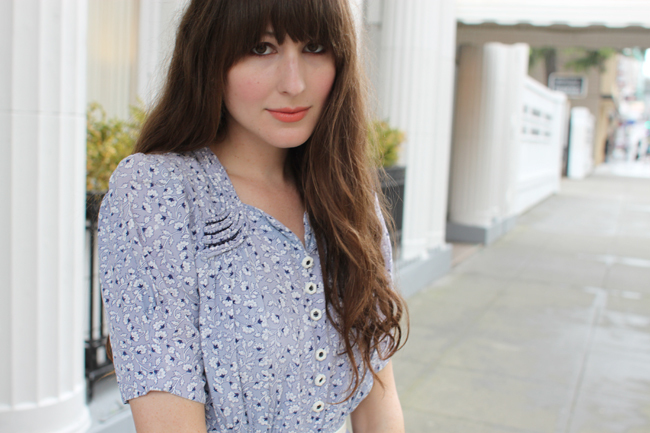 Where do you find your vintage goods in the bay area? I want to try the Alameda Flea Market some time but I hear it's so massive and I'm intimidated already...any tips? such a beautiful dress you have on. I think this might be my very favorite of all your vintage dresses - I love the colors and the buttons and everything about it. 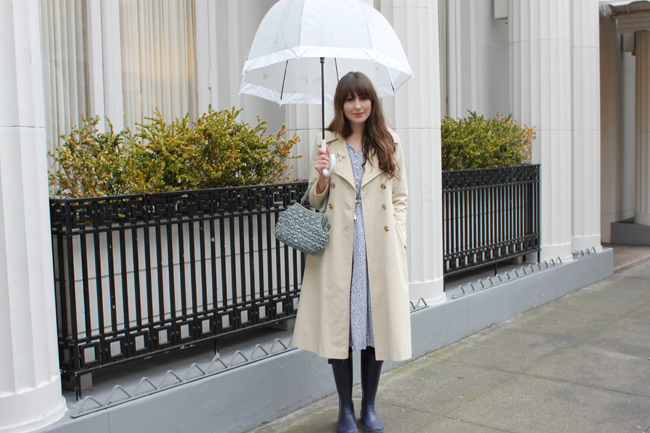 I am also really loving the length on your trench. So pretty!! I just adore your dress. 1930s dresses are just the prettiest! I adore the way the dress looks! how cute that you have matching wellies with it. Ashley, you are so gorgeous in these pics! 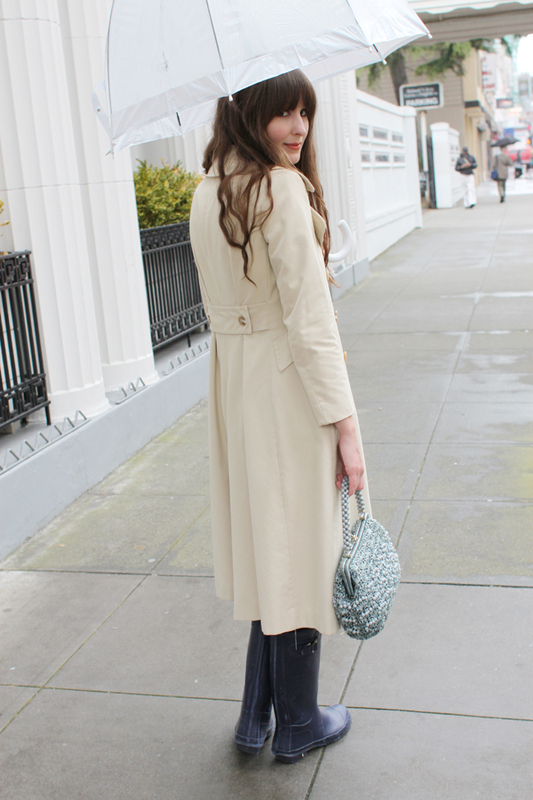 I love the bubble umbrella, the rain boots and your perfect trench coat. It's funny, but I find rainy days make the best pictures. 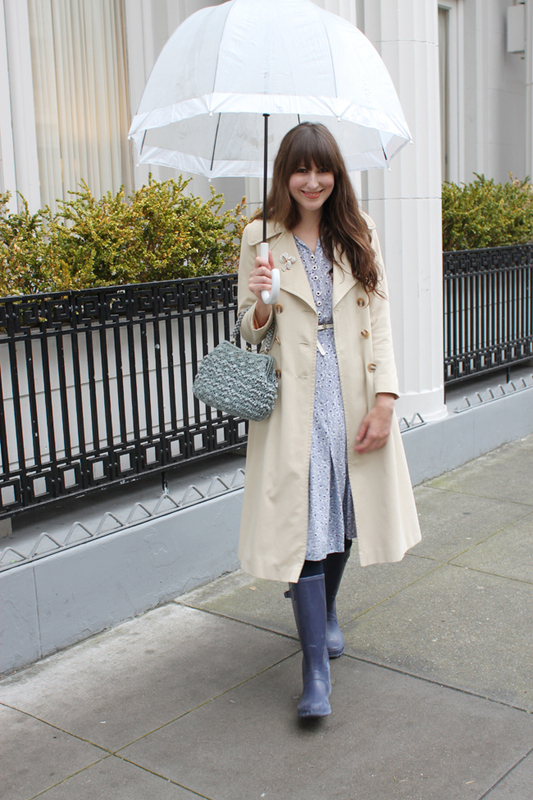 Yay for looking chic on a rainy day-- it can be hard to motivate myself to get dressed when it's gloomy and wet outside. Love the little '30s dress on you and the bubble umbrella is lovely-- I need to find a replacement for my vintage one so will check out vista soon.